As many of you know, I was born and raised in a suburb of Vancouver, British Columbia up here in Canada, before moving out to the frozen prairies of Calgary, Alberta. I will never be used to these winters from hell, as my #VancouverSoft lifestyle made me unprepared. I truly had no idea how much my soul missed Vancouver until just recently when for two weeks we saw family, my closest friends, explored the ocean, ate all the seafood and pasta, and generally had the time of our lives. Let me give you a glimpse into our vacay, what we got up to, and tell you about my FAVOURITE spots in the Vancouver area! We decided to split up our road trip to Vancouver into two days, staying overnight in Vernon, BC which was one of our better ideas! The boys have only stayed in a hotel a few times and find it quite the experience, so I'm glad to have provided them with that opportunity, and having a break helped keep both Hubs and my sanity in check! The next morning we headed into Lake Country and stopped at my new found favourite shop called The Valley Boutique! I got to meet the owner and made a new friend because I just love her to bits. I did some shopping which you will see on repeat in my future posts, and we then headed out for the 4ish hours remaining of our trip! Seriously, the kids sit much better than I do. I just cant. Our first evening was filled with family, belated birthday celebrations and overtired kiddos. Wouldn't have changed any of it. Being in Vancouver with my family means that we get a few more breaks from the kids than we're used to. The next day Hubs drove 10 hours home (yes, ew) but before he left we got a night to watch the sun set at Burnaby Marine Park. We're wearing shades to hide our eye bags in case you're wondering! The next few days were filled with friends and play dates. Seeing my best friends after not seeing them for a year just completed me, I miss them all so much already. 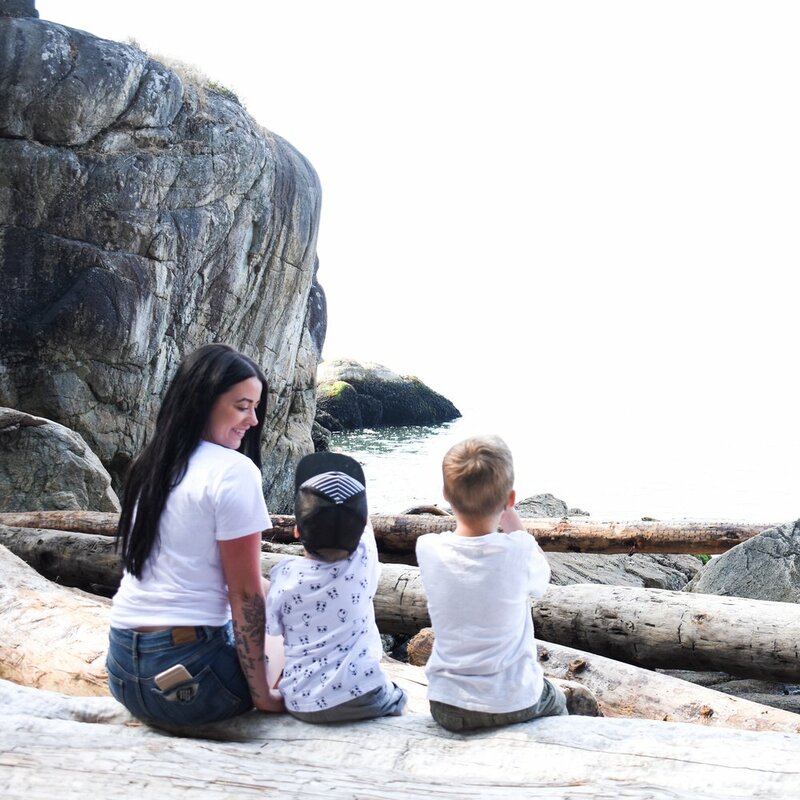 We spent our days flipping over rocks at Rocky Pointe Park, having picnics, and visiting the petting zoo and spray park at Queen Elizabeth Park in New West which is FREE - if you are in the area definitely a must do with the kiddos! This little wading pool made their LIVES - which is also FREE at Blue Mountain Park in Coquitlam... why don't they have stuff like this in Calgary?? If they do please comment below - this is a bit ridiculous! Now - lets talk food! Growing up by the ocean, I definitely took eating sushi for granted... being land locked in Calgary and eating seafood isn't exactly appetizing. Our #1 FAVOURITE sushi that we have tried in Vancouver (and we have eaten our fair share) is Gaya Sushi in Burnaby - oh you guys. Unbeatable, hands down, 100%. just go. We drove a half-hour for that sushi more than once in the two weeks, and I'd do it again. Most people in Vancouver know this one, but there is a one-off pasta restaurant in Burnaby called Antons Pasta Bar, which serves just an insane amount of pasta for the price, and if you would ask Hubs how many pens he has won from eating it all in one sitting, you would be amazed. This place is a must visit for us when back home. If you are looking for a great environment, amazing tacos and craft beer, Tacofino is your place! It has food trucks around the city, but the restaurant is legit. I didn't have a ton of time for exploring new coffee shops sadly, but I did get to this one called Matchstick which I loved! If you were there, I apologize for our group of 9 people all being, well, us - very loud lol! Exploring around the Stanley Park Seawall in Downtown Vancouver was one of my kid's favourite activities, this year and last. The amount of things to see and do - wild seals popping their heads up, finding a large crab and then turning over rocks to find hundreds of baby crabs, collecting our favourite broken shells, and having picnics while watching the sea planes take off. Watching my boys spend hours happy playing with nature just warms the inner tree hugger inside of me... I'm a Vancouverite, its just born into you! How do I even begin to describe this one? Lighthouse Park holds a special place in my and Hub's heart. We have so many memories of going here before having kids; I remember coming here just before I got pregnant with Jack, full of emotion just sitting on the rocks looking out to what feels like the edge of the world. It's quite a hike for the kids to go all the way down to the lighthouse, let alone way down to the rocks on the shore, and I am beyond surprised and impressed that these two munchkins did it and FAST! I love this place for so many reasons, and seeing it for the first time through their eyes made it even better if that's even possible. It did end with a whole lot of sweat and a huge #parentfail as we didn't bring water or snacks... but we survived and made one of the best memories so far. Hubs came back to join us in Vancouver, and we spent the last few days having more picnics, visiting more beaches (this one here is Kits Beach... my first destination for when I go back because OMG.) and made more memories. Safe to say, Hubs had a few sad passengers in the car on the way home. But I wouldn't have changed anything about our trip, we had an absolute amazing time. I got to visit my GREAT GRANDMOTHER - with my grandma, my mom and I all in the same room. Who gets to do that? I am so thankful to be living where we are, but Vancouver will forever be my home.